Siemens is one of the highly trusted brands known for providing hearing aid products of exceptional performance, design, and quality. It was founded way back in Berlin in 1847 but began focusing on hearing instruments in 1877. Although it was recently acquired by Sivantos, Inc., and it is known as Siemens or Signia Hearing Aid in the market. It has built a major trust of customers and earned loyal customers through the years. The Signia brands have been producing hearing aids that deliver almost 25% clearer and higher speech understanding than individuals having normal hearing. Ace has always set a benchmark in minimizing size and maximizing discretion. Its ultra-small housing makes it our tiniest RIC solution while binax, the next generation of BestSound Technology, further enhances the new Ace binax’s level of discretion. Remotely controllable via the new touchControl App, users can operate their hearing aid programs, volume, bass, and treble with a few quick taps on their iOS or Android* smartphones. This makes Ace binax an optimum solution for first-time wearers or people that demand discretion and convenience. With Ace binax, your customers do not have to choose between discretion and functionality – now they can have both. Aquaris Hearing Aid is very useful for those people who spend most of the time outside. In the last 10 years, the demand for Aquaris Waterproof Hearing Aids very high because this waterproof hearing aid is very convenient for using in each weather. We can use it anywhere like in the gym, bathroom, swimming time with comfort. It provides a waterproof facility in which the battery is sealed. It provides IP68 certified in which there are not creating a problem about seepage and damage while immersion. It can be a soft ear mold during swimming. Don’t put your hearing aid near dust, perspiration and dirty places. Don’t put your hearing aid near corrosion. Always put your hearing aid in cover box. Hearing Aids Batteries are the most sensitive and very small part of hearing aids that we need to take care of. There are many batteries available with different sizes such as 5, 10, 13, 312, and 675 and there are many brands available for a battery like Rayovac, Powerone, and Duracell. Battery life totally depends on the size of the battery. Normally battery life is approximately from 10 to 12 days. Before buying a new battery you should concern with hearing health care provider, they will give you a battery according to your hearing aid. Moisture:- The first problem is generating about our hearing aids is moisture. For eliminating that problem we should have to put our hearing aid at dry place. Wax Build-up:- The second one problem is generating about our hearing aids is Wax-Build up. For eliminating that problem we should have to use service of hearing aids within three months. Eclipse Hearing Aid also called as small CIC(Completely In Canal ) is used by people who have mild to moderate hearing loss. The eclipse hearing aid is based on 2 technology levels 701 or 301 which works on discrete or digital signals. It has two color code, the red color is for the right ear and blue is for the left ear. This hearing aid is placed directly in front of the eardrum of the ear canals and it always provides the best quality of sound. Good Ear Impression:- It has a good impression because it is small in size and put into the ear canal. It is invisible. Anyone will not see easily this hearing aid when others wear it. Easy to use:- The eclipse hearing aid is easy to use hearing device. It can be placed easily and quickly. There is no risk of aid damage. You can easily change the hearing aid battery. It is placed into the ear canal with the help of the machine. It is available in different sizes. Stopping Feedback:- When any worst feedback occurs then it is eliminated by this hearing aid. The bad signal is not present in this. It stops frequently error feedback or signals. Due to this, It gives good accuracy. Manage to noise and speech:- Eclipse hearing aid manages the noise and speech both. It has the ability to differentiate between noise and speech. This device eliminates the background noise and gives clear voice or speech. Better sound quality:- It gives a better sound quality at a different level of frequencies and eliminates unexpected noise or error. It helps to improve a human’s hearing sensitivity or ability. Wind Blocking:- This hearing device blocks out wind noise and provides clear or better sound. Use 16 Channel:- The channels are used for different types of hearing loss. It is programmed for hearing loss. and based on 16 channel program. Record data:- The data is recorded by eclipse hearing aids. So that audiologist can easily analyze people hearing condition with the help of these devices and give the best treatment. Insio Hearing Aid is available in ITE( in the ear), ITC (in the canal), IIC(Invisible in the canal) or small CIC( Complete in the canal) style and it is tiny in size which easily fit into the ear canal. This hearing aids are used by people who are suffering from tinnitus symptoms and it is based on advanced wireless technology and a discrete or digital signal which provides excellent sound quality and speech understanding. The Insio Hearing device has the ability to change settings or programs easily with the help of optional remote control and free touch control smartphone app. The touch Control App controls the smallest Insio IIC( Invisible In the Canal). This device works on binax technology which has a virtual microphone and audio signal is exchanged between left and right hearing devices. The Insio hearing aid is placed directly in front of the eardrum of the ear canals. Easy to use:- The eclipse hearing aid is easy to use a hearing device. It can be placed and removed easily and quickly. It has no risk of aid damage. It is easy to replace the hearing aid battery. It is placed into the ear canal with the help of a machine. It is available in different sizes. Program Changing:- Program is changed and selects a specific hearing program with the help of the program change button. Volume control:- This device can control the volume level from low to high or high to low. The volume is set up at the desirable level. Noise Management:- The Insio hearing device manages noise and speech. It eliminates background noise or error and produces clear sound quality. It helps to improve a human’s hearing sensitivity or ability. Stop to Feedback:- When any worst feedback occurs then it is eliminated by this hearing aid. The bad signal is not present in this. It stops frequently error feedback or signals. Due to this, It gives good accuracy. Directional Microphone:-It has a directional microphone. You can concentrate on the sound of your conversation partner with the help of a directional microphone. Siemen Insio Hearing device features are controlled with the help of touchControl smartphone app by your iPhone or Android phone. This is a unique quality in this device. Intuis Hearing Aid is the type of BTE Hearing Aid. It improves the sound quality that you hear and helps you to enjoy the most precious moments. This type of hearing aid offers a reliable hearing experience in any listening situation. They remove repetitive sounds like the hum of a refrigerator. It makes the speech clearer that is easily understandable which allows you to focus on the conversations effortlessly and enjoy the little sound that makes the day perfect. Omnidirectional microphone: It is not visible and picks up sound from all directions. LifeTube: It is simple to clean, inexpensive to replace, the ultra-slender LifeTube practically disappears when it’s in place. Nano coating: Unique protection for BTE models from water and junk. LifeTip: Fits easily in the ear canal. It is easy to clean and exchange. The battery door on/off: Press the battery compartment to the rear down to the first stop to turn the instrument OFF. Fully close the battery compartment to turn the instrument ON. Battery compartment lock: When the battery compartment lock is enabled, the compartment is naturally locked when closed. This prevents the unintentional removal of batteries. Siemens Life Hearing Aid combines outstanding sound quality and refined comfort with the simple operation – the perfect complement for demanding lifestyles, especially for tinnitus. It fits comfortably in the ear and, with no hard or sensitive parts, is suitable for all wearers. Its tiny form sits almost unnoticeably behind the ear. Incredibly small, big on style, Siemens Life is designed to fit you and your life with complete ease. Incredibly small and ergonomic design. Flexible and transparent LifeTubes and LifeTips fit comfortably in the ear. Wireless connectivity for discreet control and connection to audio devices. Open fitting concept eliminates the occlusion effect – the unpleasant sensation you feel with blocked ears. 12 exchangeable colors made to blend in. Features the newest version of BestSound Technology. Motion Hearing Aids are useful for new and old hearing aid wearers which are additionally loaded with amps – designed to power up for those with moderate to severe hearing disorder. It focuses precisely on a speech from where it is coming. Then motion hearing aid adjusts the sound automatically so that you can talk easily and continue your conversation without any problem. The motion will provide Tinnitus Therapy Signal which will reduce the effect of tinnitus problem or ear ringing in a single ear. Motion has good clarity and this will help you to focus on what is important. This hearing aid has advanced technology that will automatically learn and adjust itself according to your need. It is easy to use and control. It fits comfortably and discreetly behind your ear. 1. Siemens Motion Hearing Aids PAIR! 3 Micon BTE, with accessories. SLIGHTLY USED!. 12. 2 x Siemens Motion 301P digital professional hearing aids for sale ! 8 Channel! Nitro Hearing Aid provides huge power hearing for those people who lose their listening ability totally. They use a microphone in their hearing instruments which improve speech understanding and listening ability in a typical atmosphere. These device use superpower, convenient design, and excellent technology in their hearing instruments. In addition, Nitro Hearing Aids gives high power to increase the speech understanding of the deaf person. Their instrument’s excellent technology gives the ability to deaf persons to speech and hears with their friends, family, and colleagues easily in a typical atmosphere. Nitro Hearing Aids also provides wireless connectivity facility in their instruments for listening to music and TV. It provides a wireless facility. It provides instruments that are connected telephone mode. It provides instruments with 17 different colors. Its instruments are very easy in handling. With the help of audio shoe, we can input audio. It has huge power at a lower frequency. The Orion Hearing aid is the high resolution, feedback cancellation, and directivity hearing aid. All models include smart speech understanding and comfort to listening expertise as per the wearer’s sound preferences and wishes. Plus, Orion offers wireless property options: Via the straightforward take, it will stream audio from most Bluetooth-enabled devices. It’s remotely governable via the easy Take App and also the bit management App, therefore, providing a discreet hearing test resolution to the majority of your customers. Orion BTE hearing instruments assist you actually get pleasure from the sounds that set the scene for your reminiscences. It is formed to suit every distinctive ear and each individual. That includes resistant housings and fashionable technology, every of the 9 BTE and custom models. Orion’s flexibility, broad fitting vary and dependable audiological performance make sure that you’ll supply your customers improved intelligibility for fine listening expertise in any state of affairs. Orion’s microphones focus on sound from in front of you while reducing background noise. Excellent feedback cancellation prevents plague whistling noises. This type of hearing aid machine is very tiny in size and provides a very high quality of sound and you can feel with this as natural hearing. Pure hearing aids new technology gives an outstanding sound quality that will help you enjoy the life of hearing. For instance, it made us comfortable when talking with someone by reducing background noise. People can easily understand the sound so you don’t need more effort to enjoy the sound. It contains an automatic speech Master function that raises the speaker interest above other voices. They reduce all the background noise or the voice you don’t want to hear. Advanced Best sound Technology from Siemens Hearing machine. Rocker switch or programmable push button for optional control. Wireless synchronization between the instrument and your electronic device. Mini Receiver for outstanding sound quality near the natural sound quality. Rechargeable to eliminate the problem with the battery. Customize over instrument on individual preference. Enhanced tinnitus nosier that will manage your hearing and tinnitus problem at the same time. Lotus Hearing Aid is a type of behind the ear hearing Aid which is very powerful and affordable that delivers you the best performance with reliability. It is helpful for mild to profound hearing loss. Battery:- Battery consumption is very economical in the lotus family. If the battery of the hearing aid is low then the alert tune will ring. This is very beneficial and you will never be worried about the battery. T-coil Telephone function:- Some of the Lotus models are available with the telephone function. It is easier to use them. T-coil prevents undesirable whistling when wearing a hearing instrument and simultaneously talking on the phone. Audioshoe:- Audioshoe enables audio connection directly. It is compatible with the most FM-system. It provides an excellent signal-to-noise ratio for learning in school or at home. 13. NEW SIEMENS LOTUS 12P/23P UPDATE-FUN P Digital Hearing Aid 6 Channel 2017 NEW!!! 17. NEW Siemens LOTUS 12P Digital BTE Hearing Aid Aids Fast Shipping From USA! The Sirion Hearing aid is a component of the necessities level of Siemens hearing aids designed for sturdiness and reliability. it’s scientific discipline sixty-seven rated that permits it to be submerged in water for up to half-hour and dirt doesn’t interfere with its performance. Sirion offers reliable performance once it involves intelligibility, even in howling environments. it’s available in different type and styles of hearing machine: Behind The Ear (BTE), within the Ear (ITE), within the Canal (ITC), and utterly within the Canal (CIC). This Sirion line of hearing aids is acceptable for severe deafness patients. Sirion microphones focus on the sound from the front of you while reducing noises from other directions which helps you to concentrate on your partner conversation. These hearing aids conjointly contain twelve channels for process and Improve sound quality, enhancing the sound of speech and permitting you to listen to clearly in noisy environments. Go to our Siemens Hearing Aid Price List page to find out the cost of these hearing aids. High performance, low energy consumption: High performance is accompanied by complicated functions in these hearing aids, their batteries don’t easily die, all because intelligent processes that reduce power drain and prolong battery life. There is also a rechargeable feature available in these hearing aids and require battery changes on an average of once in a year. Hear without strain: These hearing aids pick out a target speaker’s voice from background noise so that listening effort is notably diminished. Easy listening even in rooms where sounds vibrate: Rooms with hard surfaces like uncovered walls and marble flooring reflect more sound than rooms with carpets and similar items that decrease echo. The Echo Shield function reduces interference due to reverberation, ensuring speech signals are clear and listening effort reduced. Make phone calls with ease: The best feature is that it automatically detects a phone nearby and turns on. The user can hear caller’s voice in the hearing aid next to the phone receiver, they can also be transferred to the hearing aid in the opposite ear, ensuring a high level of speech understanding, even in noisy surroundings. Follow every conversation effortlessly: For some people having “hearing loss“, daily situations like conversations at a metro station or bus stand are also a challenge. But Signia hearing aids limits the speaker of interest and reduces any sound disturbance from the environment. A whole new music experience: Another endearing feature of these hearing aids is that it easily connects to HD Music programs to improve the sound quality of music, whether it is playing live, through a stereo system, or during an onstage performance. TouchControl App:- This app allows easy and discreet adjustments to hearing aids by using your smartphone and it is compatible with all Siemens models. easyPocket:- It is a remote control which can pair with almost all hearing aid models to provide you a more traditional remote control facility. easyTek:- It is used as a streamer to effortlessly connect Tv, Mp3 player, mobile phones and personal computer directly to your hearing aids. eCharger:- This device is used to easily charge selected Siemens hearing aids. This device automatically removes harmful moisture from your hearing aids while charging. We hope that after reading this article, you will have enough knowledge of various techniques available in the Siemens or Signia industry. 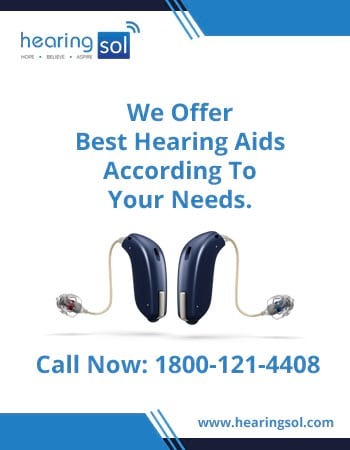 You can also buy hearing aids at a great discount from HearingSol.